Blackbear Forge hasp under the top. 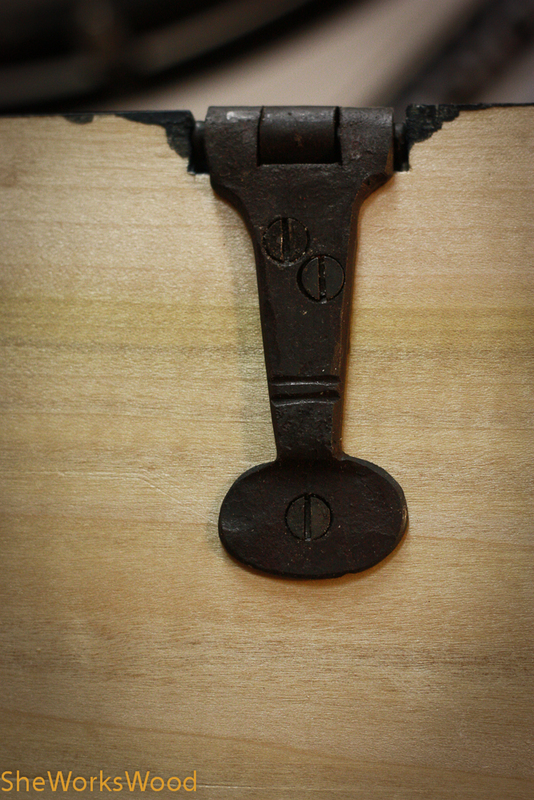 Blackbear Forge logo and detail. Bottom compartment with ample room. 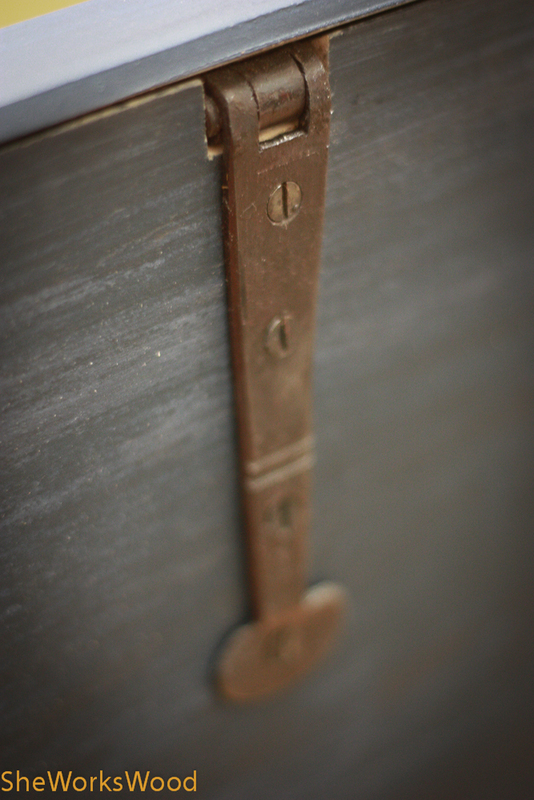 Bread board end lid detail with copper rivets. I added the final details to the chest. It didn’t take as long as it might have appeared. The chest really came together quite quickly, but work really got in the way of this project. If I had used Home Depot pre-milled lumber instead of wide rough popular the project would have been very fast. 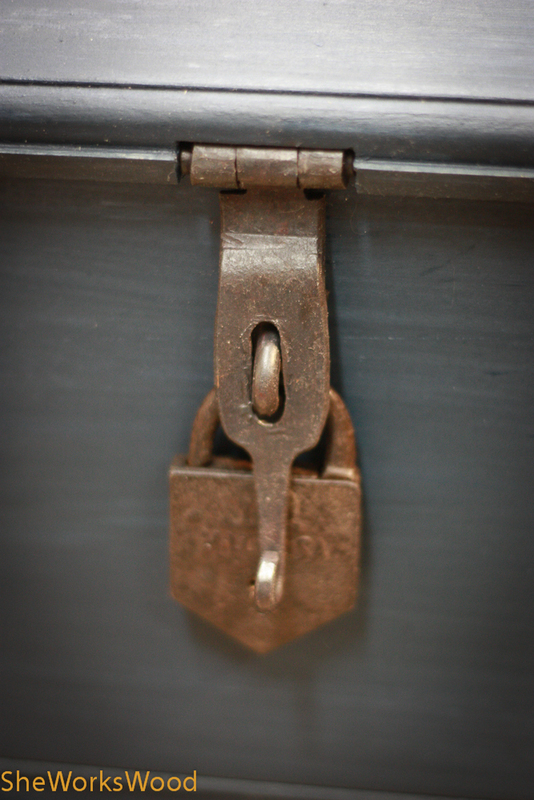 One of my favorite details are the hinges. They went in really easily and I thoroughly enjoyed doing business with John Switzer over at Blackbear Forge. My only regret was that I didn’t take pictures because I squeezed the installation in here and there. I also used nails instead of screws for the joinery and the handles (more cinched nails). 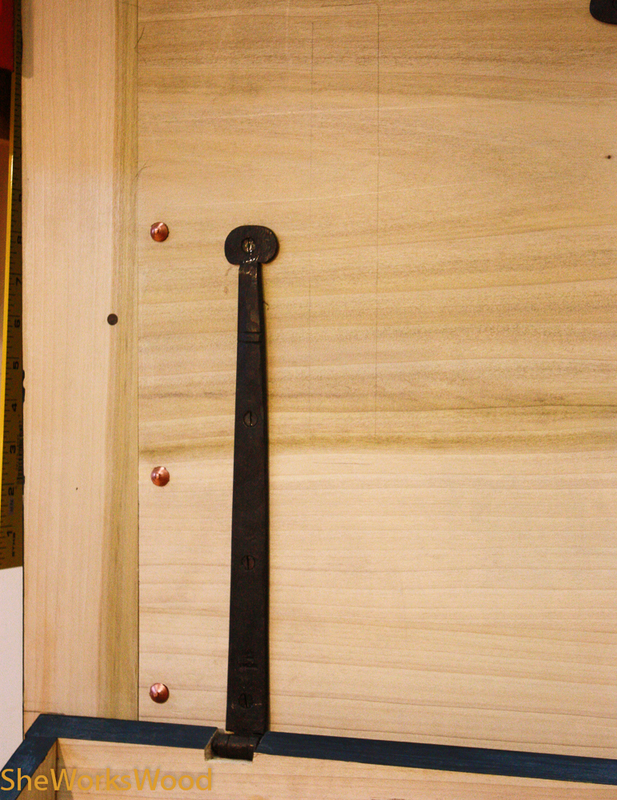 But the hinges are screwed as well as the chisel rack. I also made some of the dividers adjustable. The moulding was cut by hand using my newly acquired moulding skills from Mr. Bickford and my really awesome moulding planes from Philly Planes. I decided against the saw till under the lid because my most used saw didn’t fit without complicated angles and spacing to avoid the tools below. I might put one in later. I’m really happy to have all those tools under cover. Here are the rest of the details. 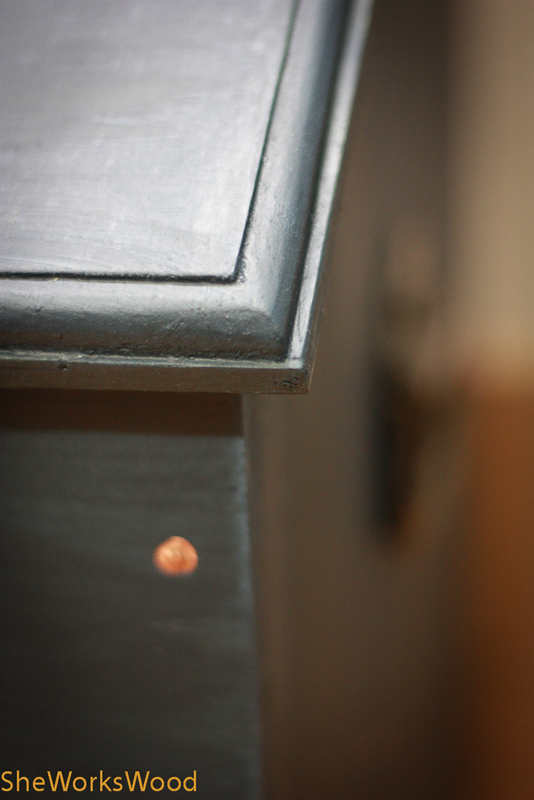 Milk Paint Finish with Boiled Linseed oil on top. For a closer look at any of the pictures, right click and open in a new tab. 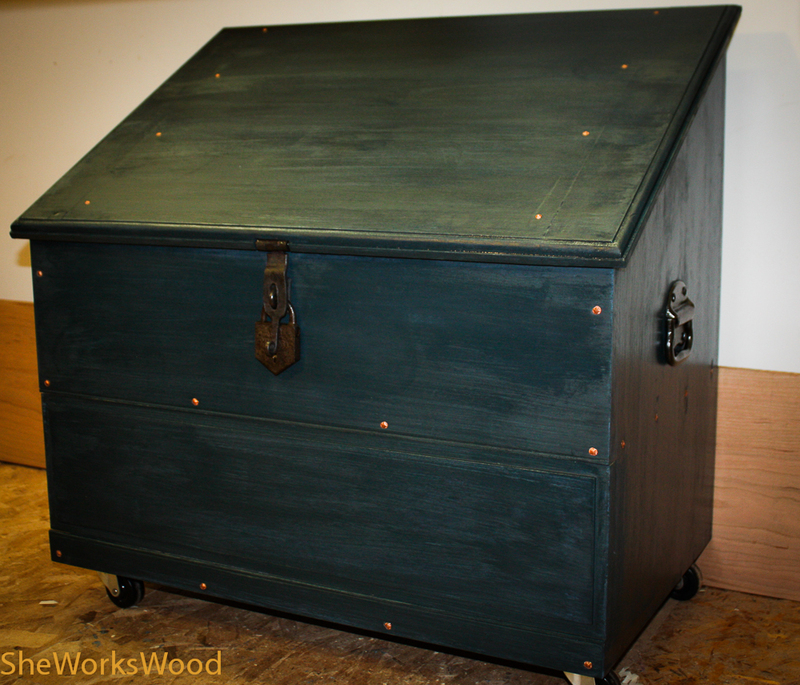 This entry was posted in Dutch Tool Chest, hinge, moulding and tagged dutch tool chest, hand cut moulding, milk paint, nails. Bookmark the permalink. Nice work. Especially the molding. I cant ever seem to set up my molding planes the way I want them. The hand forged hinges are a nice touch. Anthony, not sure what kind of moulding planes you use, I confess to using only new ones. I have yet to aquire the skills to bring the old one back to life. Very nice. I love my Black Bear Forge hardware, too! And after lugging an English chest on the road last weekend, I foresee a Dutch chest for travel in my future…and some more hardware from John. Megan! Got Dutch! I’d love to see how your’s turns out. Wonderful project, lovingly executed. I am not fond of reaching down for tools frequently used, but probably works for you younger folks. Being able to roll it to your working area is a welcome feature. Use with pride, Marilyn. Very Nice! I really like the hinges. Marilyn, Thanks for taking the time to share this project with us. It is gorgeous! Think someone 100 years from now will be looking at it and thinking about who made… …what tools were used… and so glad that it has come into there hands! Have you signed & dated it? Roger – ahhh .. you know what, I forgot to sign it. Doh! Must fix that. Sadly there were no marks to identify the maker. As such, I can’t sign it as I didn’t make it, but I can keep a log of how I found it and what modifications I’ve made to suit my needs. There are very few hangers/holders inside the doors or on the back of the cabinet so since it didn’t come with their tools at least it gives me a (almost) blank slate to work with. Nice square ovolo. And thanks for clocking your screws. Marilyn,Where did the handles come from?? The wonderful world of ebay. Looks good. How much do you think it weighs fully loaded? I also like you bench picture and the way you have moved it out from the wall. The chest full of tools weighs around 105 lbs. 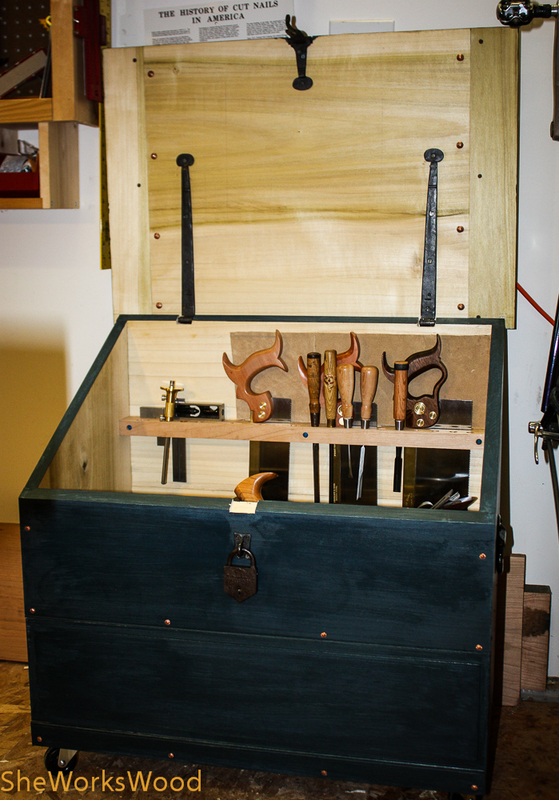 I love my new set up and with the chest, I now have all my hand tools within easy reach and on my side of the bench. Sweet looking chest and shop. 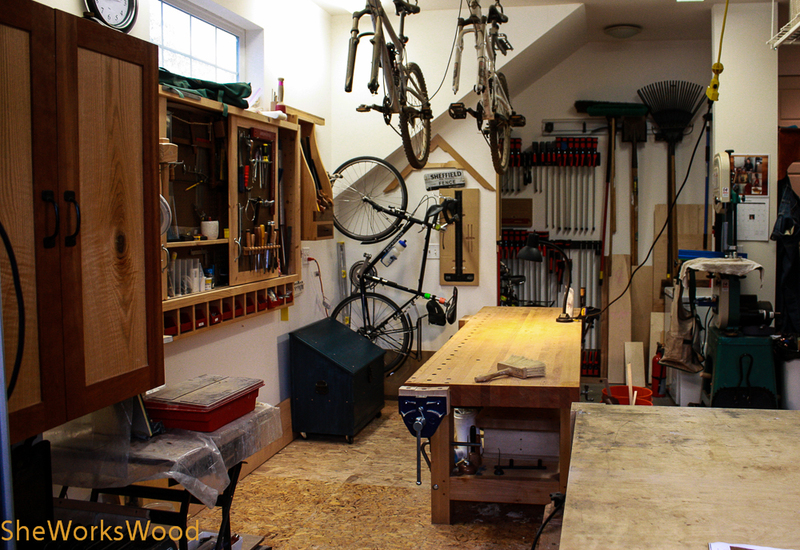 Wow, looks amazing, what a great home for your tools, enjoy! Really nice Marilyn. 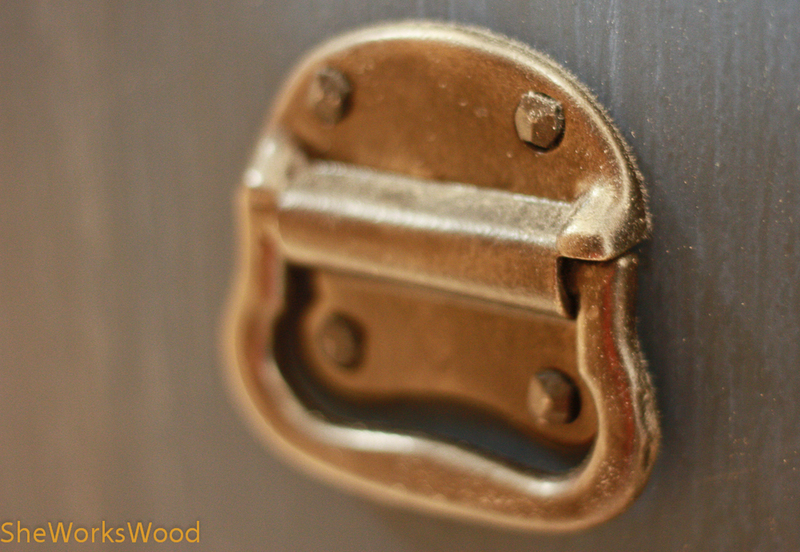 Nice crisp woodworking, beautiful finish work with the paint and copper accents, and great hardware. I can’t wait to see what you build next! Joe – Ok .. no pressure right? 😀 My next project is actually in the pictures behind the chest. I’m in desperate need of an actual bedside table. Good work! Thanks for sharing it with us. I couldn’t help but notice two other cabinets, which look like they might hold tools (on the left in the last picture). Do this cabinets still house tools or are they now a bit obsolete. Just curious. Oh, and I can’t say enough about the copper accents. Way cool. OK .. busted! I have, in fact, tried/am trying to keep my tools acquisition in check. The cabinet nearest in the shot holds my joinery/specialty planes (my #6, rabbet, plow, extra blades, rasps, spoke shaves, etc. The long flat cabinet directly behind the bench is peg board storage and has a variety of hammers, pliers, screw drivers, screw storage, lay out tools, some chisel, etc. 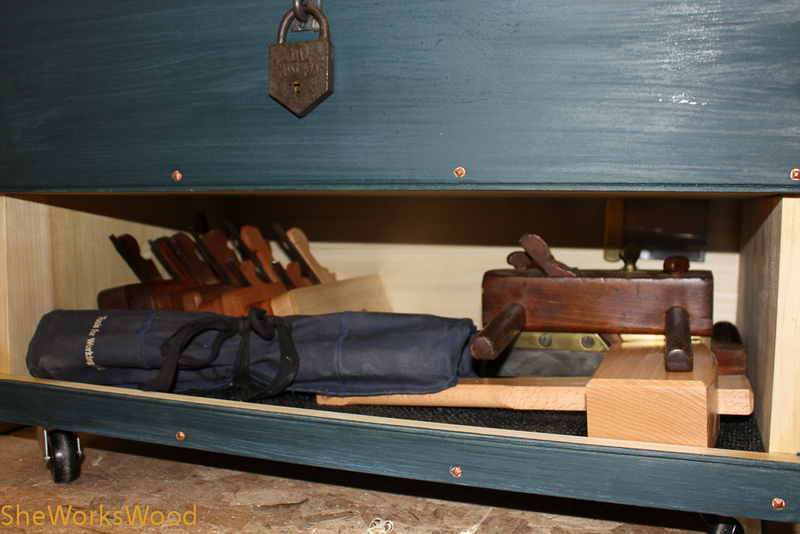 The top compartment of the Dutch holds the tools that I use every time I’m at the bench – my bench planes, back saws, combo square and some specialty chisels. 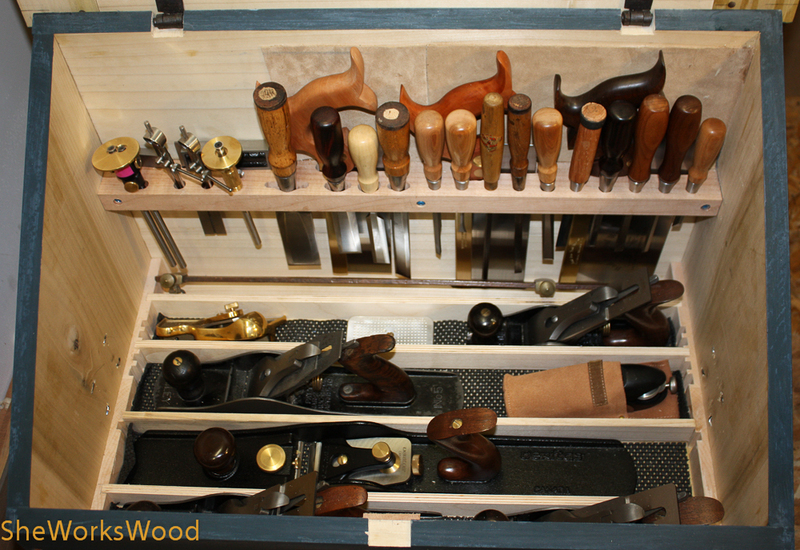 The bottom compartment holds things I use rarely – moulding planes, brace and bit, a large plow plane, etc. What I love about the new set up is that I don’t have to walk around the bench to get much of anything. It’s all along the aisle behind the bench. Ah, Marilyn, this is great. And convenient! I love the hardware. Very nice job! Thanks so much! If I had made it out of elm, no way I would have painted it. Umm, umm .. cant’ wait to see how your’s turns out. PS. I don’t think getting excited about your new stash of wood is silly at all.